I’m used to getting trash talked. That’s why I named my username the way I did… to tilt people. There are times that it doesn’t go as I would hope of course. 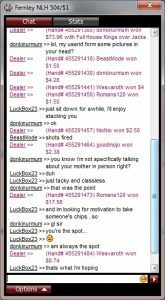 So I’m having a fairly decent session when I start catching some trash talk from the rail. I think I’ve played with this player before but not too often. 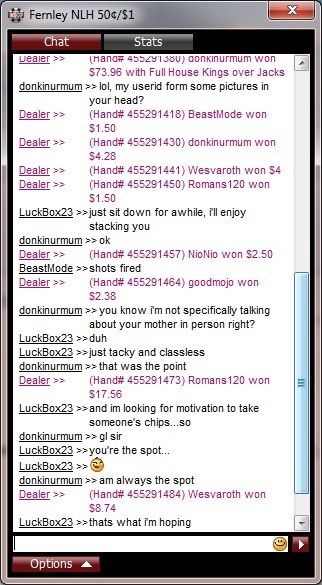 I lob some banter back with him, but generally just tell him good luck in taking my chips. 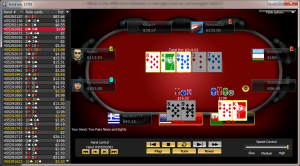 Trash Talking from the rail. And as if scripted… he sites down to my right and one hand later we play headsup in a small blind vs big blind battle. And well… a picture tells the story. Well, he did say he’d stack me.